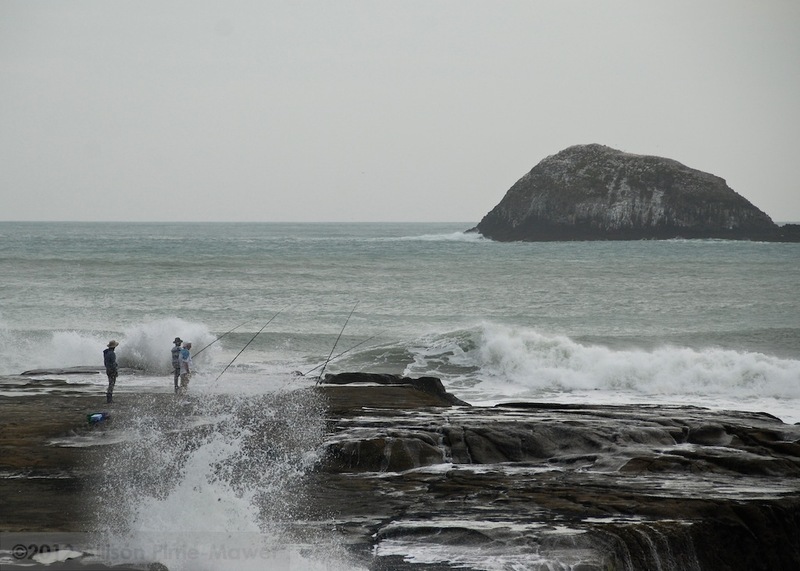 It doesn’t matter how many years I’ve living in Muriwai, I’m still in awe of it’s beauty with it’s black sands, crashing sea and moody colours. Most people will run to the beach on a sunny warm day but I love it best when the skies are overcast making the thundering waves look all that more menacing. Eight foot waves where tubing in, I looked longingly at them and the daring riders rocketing down the wave face. 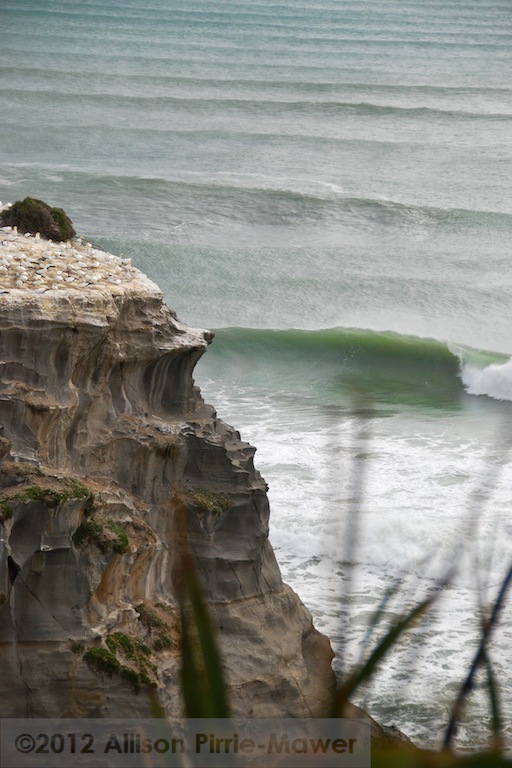 But I confess they are far to big for this surfer. When the wave height drops in a day or two I will be out their with the rest of them, nodding when they say it’s been an awesome surf week, omitting the fact that I was watching not surfing earlier in the week ;o). So I ran for my camera and caught a few waves on film instead. It’s it such a beautiful place? It was still a balmy warm day, perfect for the ice pops I had stashed in the freezer for such an occasion and I was thirsty and exhausted just watching all the action out to sea. 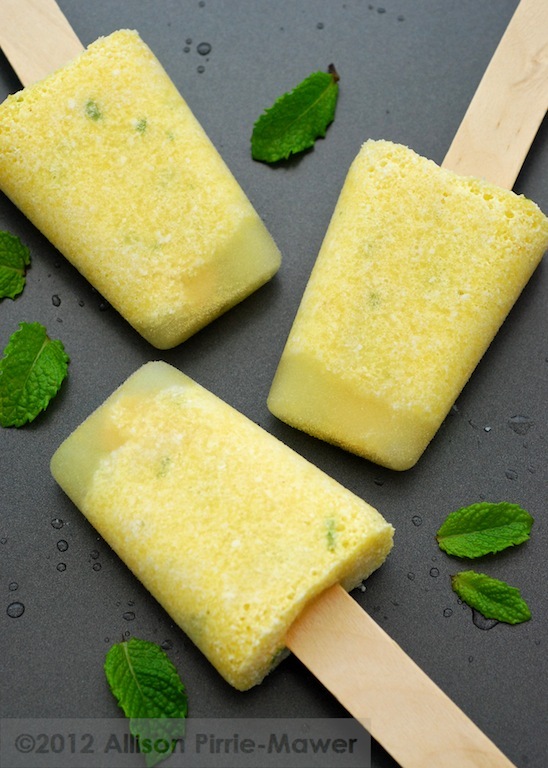 Just a simple treat of fresh pineapple, mint leaves and coconut milk all whizzed together and poured into your favourite ice pop container. 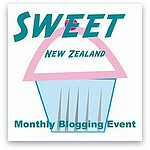 I’m submitting this to our monthly Sweet NZ mingle which is being hosted by Arfi of HomeMades. If you pop over you will be sure to find a lot more sugary delights to tickle your taste buds. Whiz all ingredients together in a food processor or blender then pour into ice pop containers and freeze overnight. You can vary them by replacing the yoghurt and water for any fruit juice, coconut milk or regular milk. For more ideas, Emma over at My Darling Lemon Thymealso bogged about an exotic berry Lassi last week, this is definitely one to try. 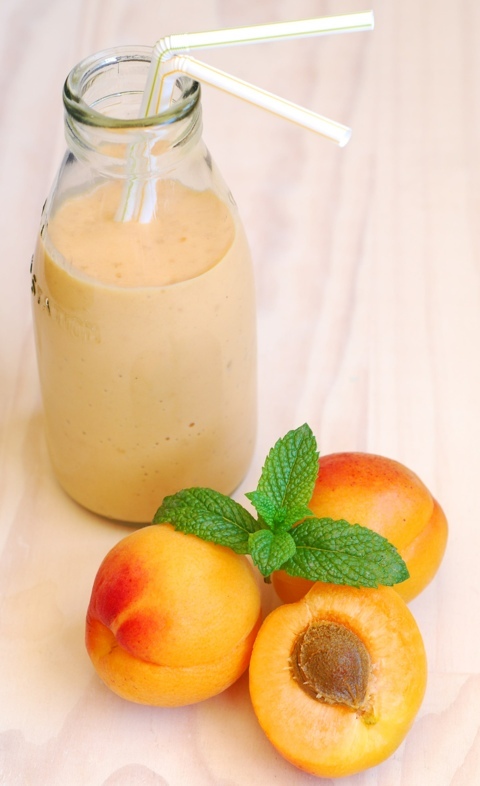 If you have a glut of apricots why not make a larger batch of smoothie and freeze down the rest as ice pops. I use my tall shot glasses since I don’t have dedicated ice pop containers and the wooden ice pop sticks are easy to find in the shops. Place all the ingredients into a blend and whiz to a smooth drink. 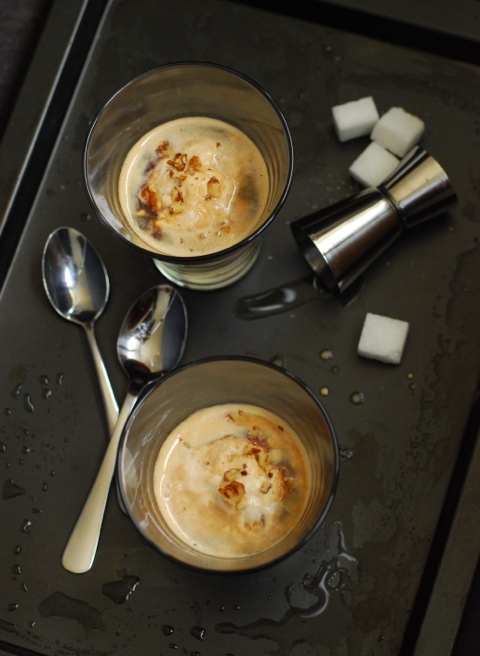 Weekend chilling, a book in hand, a big bean chair on the deck basking in the sun and an hazelnut affogato to finish the picture. Ten years ago I would have thought this a fancy pants way to drink coffee but that was before being enlightened by the coffee culture in New Zealand. I didn’t drink much coffee before I came to NZ, it wasn’t very good in the UK although I had started to enjoy a Milch Kaffee in Frankfurt while living there but was still very much a British tea girl. New Zealand has an amazing coffee culture, the skill of a good barista is highly sort after as it is not just the quality of the beans that makes the perfect coffee. I was a little lost walking into my first coffee shop with ‘flat whites’, ‘lattes’, ‘macchiatos’, when all I was used to was the bog standard black or white coffee. It didn’t take me long to become part of this culture, I can be found most mornings stopping by my favourite coffee shop on the way to work, they know my car and my preferred coffee will often be on the counter waiting for me as I walk. 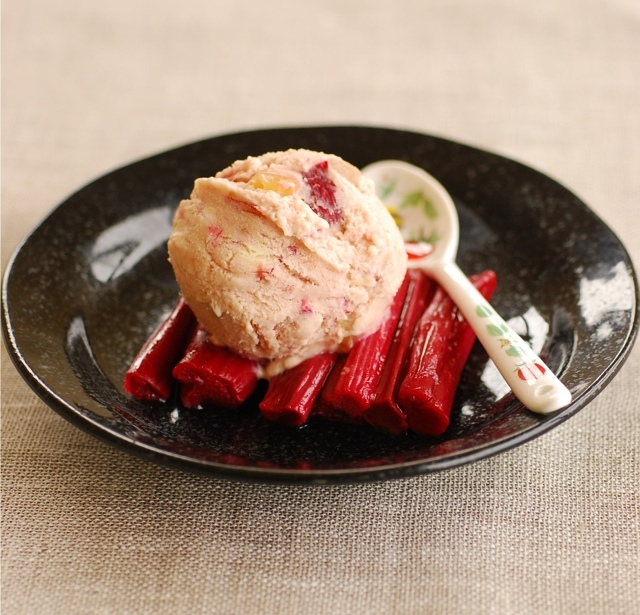 I have to confess, when making my Rhubarb quinoa crumble last week I already had this ice cream in mind and did a little time saving by roasting a double batch of rhubarb off. I’m all for short cuts particularly if time is limited and it means extra desserts on the table! Ice cream is really easy to make if you have an ice cream maker. You can make you own custard base, cheat and buy a carton or I have even been know to use Greek yoghurt instead of the custard. Of course Gelato is even easier with its cornflour thickener with no chance of curdling the eggs if you are the impatient type….do I sound like I am speaking from experience? I highly recommend roasting your rhubarb rather than poaching it as it helps retain the rich red colour. Of course it helps if you start off with a friends home grown crop of ruby red rhubarb which is not always the case with shop bought. Churn in your ice cream maker as per manufacturers instructions. You can make it without a churner but I am not the patient type to keep taking it out of the freezer every 15 minutes and whisking until it is frozen. We had the sorbet as a palate cleanser as part of a dinner but I am certain it will we a favourite during the summer months as we swing on the hammock in our garden watching the white clouds skit across the blue sky. Hurry up summer! 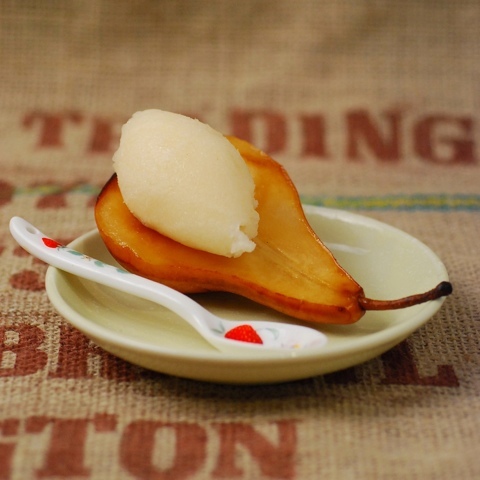 Place the peeled and cored pears, water & sugar in a pan over a medium heat. Simmer until the pear has softened. Add the vodka and blend everything into a smooth consistency. 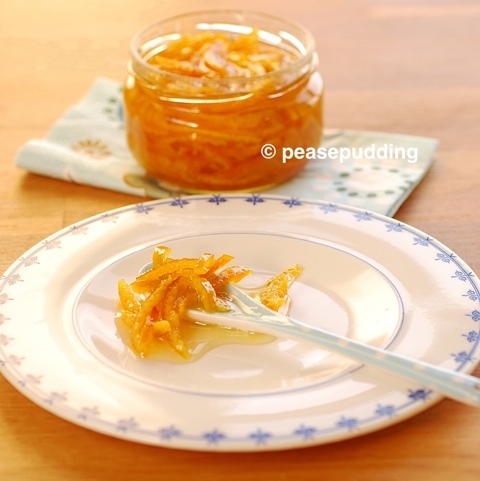 Place in a shallow container and freeze until solid. Remove from the freezer and mash the mixture to a slushy consistency. Whisk the egg white and combine with the ‘slushy pear’ mixture completely. You can do this with a hand or electrical whisk. Place back in the freezer until re-frozen. It will not go complete solid since alcohol doesn’t freeze but will have a good smooth sorbet texture, so don’t be tempted to add more vodka at the beginning as won’t freeze at all! The pears were just grilled with a sprinkle of sugar and lemon juice, they were quite ripe didn’t need much cooking. I had planned hearty winter pies and puddings this weekend, a last dash of winter goodness before we start thinking about trimming down for summer beachwear (usually a lot of thinking and not doing). 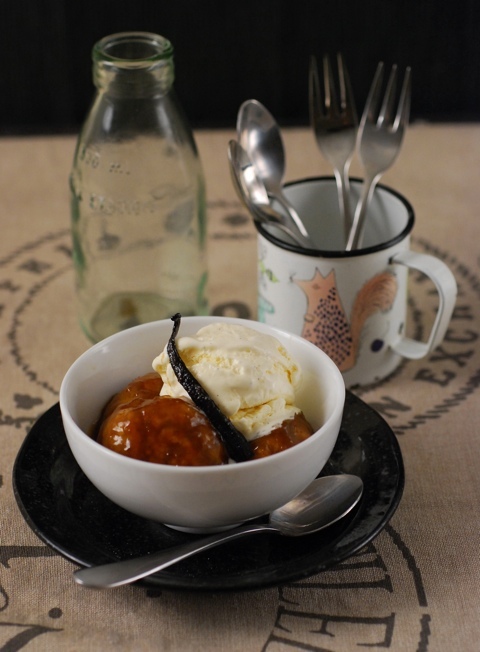 But the weather really turned on spring this week with warm glorious sunshine, it should have inspired me to make lighter fare but I was still on a roll with my winter waist expanding recipes like these apple dumplings. I had seen a spiced dumpling in the Gourmet Traveller this week and it made my mouth water, always a sure sign it will be on my menu soon in our house Such a simple dish but a very decadent one that reminds me of old fashioned puddings. Place the water, brown sugar and 30g butter in a wide saucepan over a medium heat until the sugar has dissolved. In a large bowl combine the castor sugar, flour, rest of the butter and spices. Rub the butter into the flour to form fine crumbs. Add the egg, grated apple and milk and bring dough together. Roll golf ball size pieces of dough to form balls, makes 12-14. Add to the syrup and simmer over a low heat with a lid covering the pan. Cook for about 15 minutes, turning the dumplings occasionally. The dumplings should puff up and become fluffy. Serve dumplings with syrup and vanilla ice cream. The perfect way to enjoy a warm afternoon swinging in a hammock with a bowl of fresh fruit in the form of a blackberry daiquiri. The thought makes me a little sad, our summer is coming to a close knowing that there will be less days swinging in the hammock. 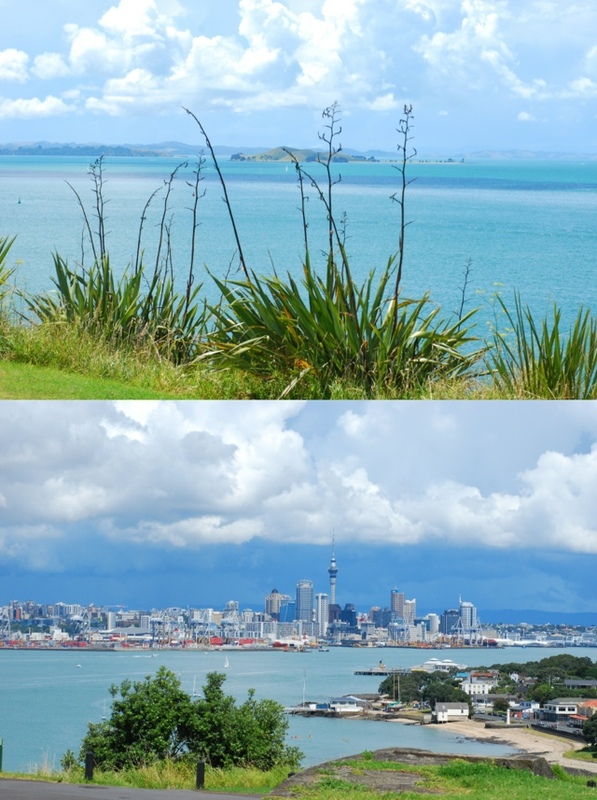 It has been a great summer, one of the warmest on record with hot sunny days and humid nights, waking up to 13 degrees this morning was a bit of a shock after the temperatures suddenly plummeted. There is still some Daiquiri in the freezer and I am sure I can persuade people to enjoy it as a funky pre dinner cocktail or or even as a palate cleanser in between meals so it certainly wont go to waste. In a bowl, whip the egg white to soft peak. Place all the ingredients other than the egg whites into a blender and blend to a smooth pulp. At this point you can strain the mixture through a sieve to remove the seeds or you can leave them in if you don’t mind a seeded sorbet. 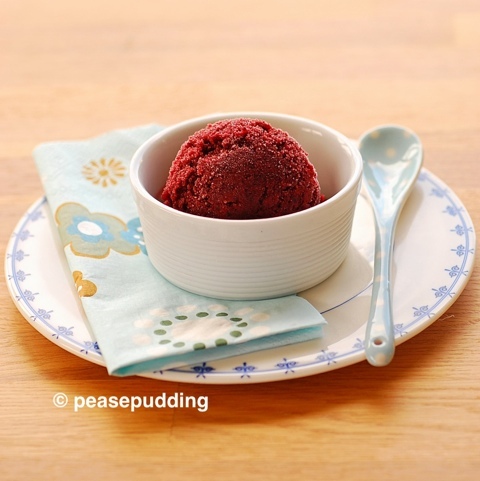 Fold the egg white into the berry mixture and pour into the ice cream maker and continue as per the manufacturers instructions on your ice cream maker. If you don’t have a maker, pour the sorbet mix into a container and freeze. The egg white prevent it from solidifying and keeps it light. This is what I call cheats ice cream! We had an impromptu dinner last night at our place with friends and fortunately the pantry and fridge where full since I had planned on trying out a few new dishes over the long weekend. But dessert hadn’t factored into that planning as I have been trying to indulge less in that area. We created Japanese Takoyaki with another cool gadget I have, a post I hope to share with you next time I make them and a fennel, cucumber & seafood salad which I will also post soon. But dinner is not the same for me if it doesn’t end on a sweet note. 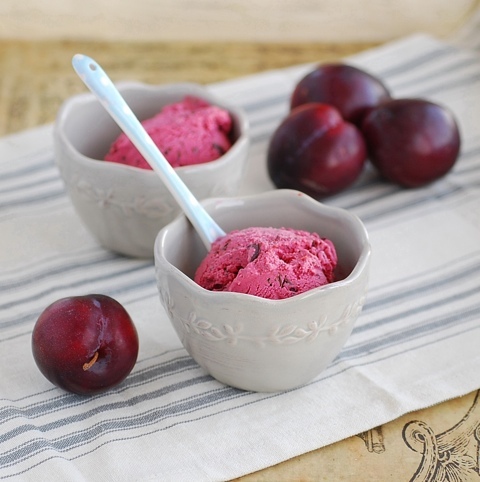 I had a few cups of stewed cinnamon plums in the freezer and some custard and cream in the fridge so we decided to whip up a quick ice cream. I just love my ice cream maker, you can produce a dessert in minutes, particularly since this one was cheating by using ready make custard rather than making a creme Anglais. We just would have had the time for it to chill down and there is nothing wrong with a few short cuts is there? I also added a generous helping of shaved Whittakers Dark Ghana chocolate to the mix. I loved this impromptu dessert, the tart plum against the creamy custard with a rich bitter bite of chocolate. My guest loved it too but I told them we couldn’t eat it all since I would have to photograph it the next day so lucky for me I still have some left in the freezer! For those of you who are local I bought the gorgeous little bowls and linen from a the Ambience Home & Gift store in Huapai. Mix together the custard, sugar and stewed plums. Fold in the whipped cream and shaved chocolate. Follow manufacturers instruction for you ice cream makes. A New Year, a new beginning and after two weeks of holiday and festivities with lots of food and liquid calories consumed, a chilled beer in the our mid summer evenings is off the menu….well mid week anyway! 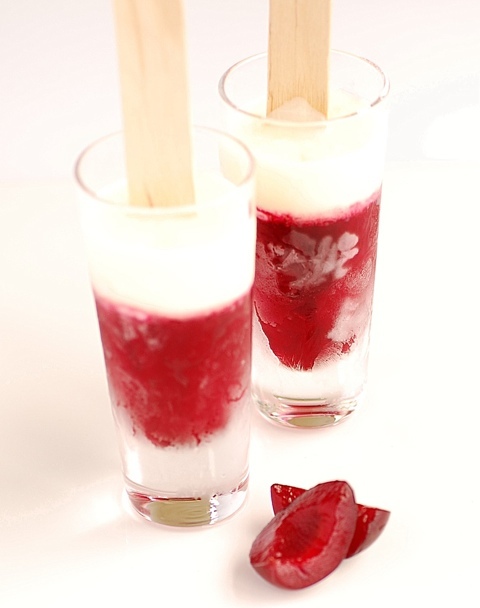 Instead we are cooling down with a nice tart plum, cinnamon and yoghurt ice pop, or should I say ice block or lolly depending on where you live. We have tons of stone fruit at the moment so I stewed a few kilos with some cinnamon sticks and star anis but didn’t want to make jam again this year so instead froze them off into little blocks of trend ice pops. I almost feel quite righteous consuming these funky pop ice since they are mostly fruit and a token bit of sugar and yoghurt. There is no specific recipe but more a quantity ratio depending on how many you want to make or how many shot glasses you have in my case, not possessing any actual ice pop containers I had to raid the glass cupboard. De-stone plums and place into a heavy bottom plan with the sugar, cinnamon and star anis. Simmer over a low heat until the sugar has dissolved and the cook for a further 5 minutes. Press through a sift if you want a smooth consistency or blend if you like all the fruit. Pour into ice pop containers and place in freezer until almost frozen then insert the ice stick. If you forget and it freezes you can always use a hot knife to make an incision for the stick. When completely frozen pour in yoghurt slightly sweetened with sugar and refreeze.